Between the holiday season, weekends and the near Hajj season, King Fahad Causeway could get hectic! A great deal of individuals, businessmen, families and hajj agents are going through the causeway on both directions, which means longer waiting period and long queues at the insurance cabins. We are here to help you in reducing the waiting time and making sure you use your time on what is more important; the trip itself! Through the service of ‘King Fahad Causeway Insurance’ you can issue your insurance document then you are bound to have a head start in the procedure of entering or exiting through King Fahad Causeway. The service is provided by Information & eGovernment Authority in cooperation with the United Insurance company available both on the National Portal (Bahrain.bh) and eGovernment App Store (Bahrain.bh/apps) in the eTraffic app. By downloading the app on your smart phone you will have a direct access to a bundle of traffic’s services. 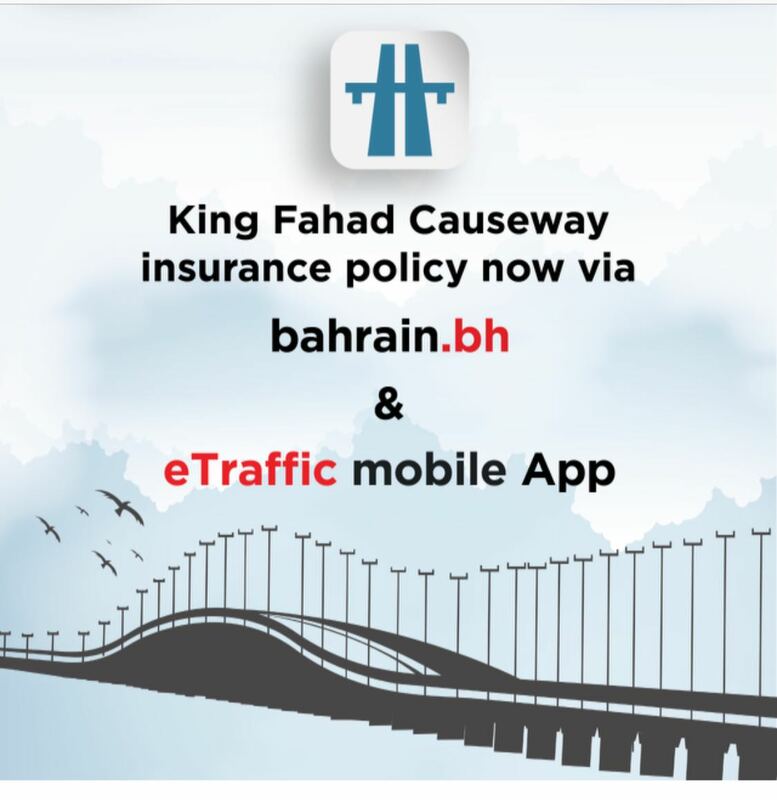 To further highlight the ‘King Fahad Causeway Insurance Service‘; it allows you to get over with the insurance process simply by clicking on the service, then you can proceed with the payment of the insurance fee online, preview on current insurance and the previously purchased ones as well as adding more vehicles or drivers. One of the application’s features is that it allows the user to change, add or remove the information of the vehicles he will be using. All you need to do is to choose ‘King Fahad Causeway Insurance‘ service, for individuals all you need to do is to enter your CPR number while commercial companies need to enter their CR numbers and the vehicles’ information is required for both individuals and commercial companies. The service completion will be verified through receiving a text message that indicates the success of the registration and payment and through receiving the incurrence policy and number via email. For any suggestions or enquiries, please contact us via the National Suggestions & Complaints System ‘Tawasul’ on Bahrain.bh or the mobile app via the eGovernment Apps Store at Bahrain.bh/apps.